The problem with snowchains has always been fitting them in unpleasant, freezing conditions. So the quicker they can be fitted the better and Thule Easy Fit snow chains take less than 12 seconds to fit. On October 8 this year, Thule achieved a Guinness World Record as 12 people of different ages mounted Thule Easy-fit on 81 wheels in less than 1 minute. This means that it takes less than 12 seconds to mount a snow chain. of design, finish, material and innovation level, as well as functionality, ergonomics and safety. The innovation in Thule Easy-fit is the central strut, made in aluminium with an integrated pedal linked to a flexible unit and buttons for unlocking. The pedal activates the automatic tensioning system that further tightens the chain when the car is rolling. The stable bows on the inside of the wheels make it easy to mount the snow chains from the top of the wheel and down. 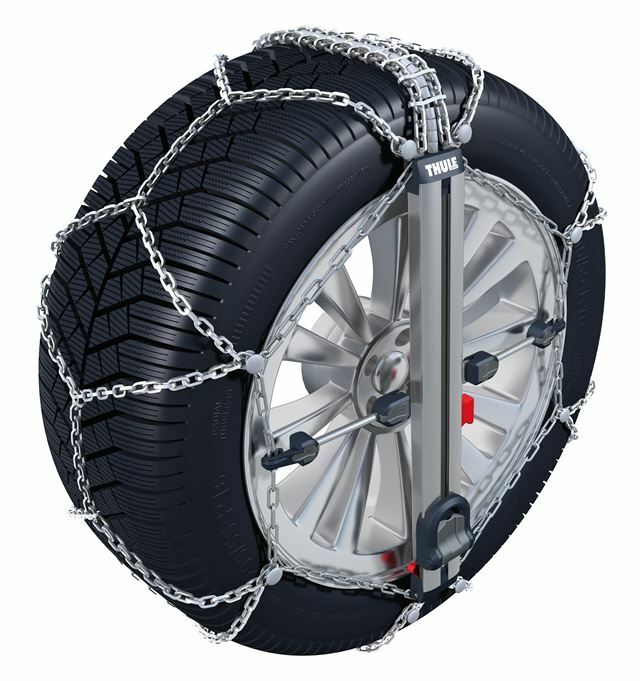 It has never been such a quick job to fit snow chains, without the need for physical power and chains that can be tightened using your foot. That it can be done simply and quickly is more important in difficult weather conditions, which you are often facing when it is time, to use your snow chains. Good idea, but £260.00 each! !